I don't know. All I can tell you is I made those bookmarks for the top level pages for my own use, mostly because they are much faster (with or without the new & much appreciated search function!) to load into my browser than waiting for Apple's built-in help viewer to open the respective Affinity (or almost any other sizable) help book, which typically takes forever to open. Also, its search function often does not find what I am looking for either at all or as quickly as the Google-powered online one does. The online version just works better so that is what I use. ...Say I'm reading something on one of the pages and want to search for that term. Without having already thought of making and saving away a bookmark what is 'Ms Average' meant to do to search the site for the term? nope, that means a new tab or browsing away.... I'm not saying it's not possible to search this site... I'm saying there is no point in us adding this feature to the site on the landing page never to be seen again as you go on to use the site as designed. Am I being unclear here? I know what you mean and IMO your best way and option here is so far only, to also add an clear visable "search icon" with an associated link (which then expands to the initial start search page), on the left side bottom down pages there. Beside the "Copy link to clipboard" icon! Another possibly way which came to my mind here is, to just use an always being there positioned floating search button on the right side. When you hover that floating button it will then slides out the search field for input, otherwise being less unobtrusive there if needed. This way you don't have to go to a search landing page at all and can perform the search from where ever you are, so to say one can then perform a search from inside of any actual help page. I believe this can also be combined with the previous left side bottom icon suggestion then, meaning here instead of an always being there visable floating search field & button on the right side, then just showup the right side flaoting search field when that left bottom side button icon is pressed. I think this makes sense. It's like using google to find content on a shopping website rather than using the search on the shopping website. I can relate since I'm an organization freak. I have an idea. Seeing how all the content is on the left, why not slightly shift them down, and place a home icon and search box right above the different sections? That way, everything is pinned and in one place. A question about the online Help files, and the newly added Google Search ability. If you have a Trackpad, you can use 'pinch to zoom' to zoom in and out at any time, regardless of tool selection. 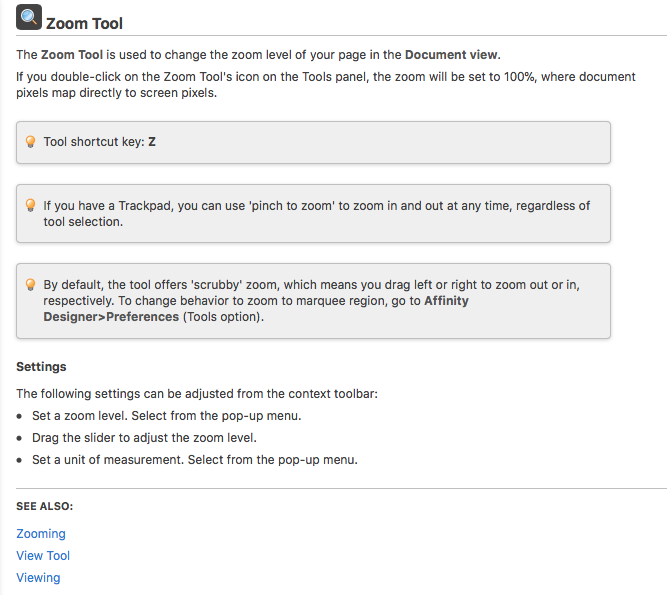 By default, the tool offers 'scrubby' zoom, which means you drag left or right to zoom out or in, respectively. To change behavior to zoom to marquee region, go to Affinity Designer>Preferences (Tools option). If I click on the Zoom Tool result, nowhere on that page can I find any of the preview text that Google provided for me. As my local search of the Windows help for Designer does not include the word scrubby at all, I suspect that is only a Mac setting, which leads me to wonder if the online Help is perhaps based on the Windows help file, but the index is based on the Mac help file? Or is something else going on? My Help file has a box with the text "Tool shortcut: Z key". The online help has "Tool shortcut key: Z". Below that box, my local help has a box with the text "If you have a trackpad, you can use 'pinch to zoom' to zoom in and out at any time, regardless of tool selection." but that box/text is missing from the online help. So the online help seems to be missing parts of what may be Mac-specific info, but also seems to be missing part of the Windows info. I tried tricking the page into loading what I might see if I were running Windows by changing the 'user agent' to identify my Mac as a Windows PC running a PC browser but without success. I've used HTtrack Copier and successful now. I think you can try! Hi there, may I make a request? For each topic, there is a navigation explaining how to get to the topic (Home > Learn and Share > Resources). My request is if you could do the same for the Affinity Online Help Resource. If I were to search for something like the Node Tool, for example, then I could see through the navigation, okay, that's how you get there. And then, next time, I'll remember. Also, if I want to go back to the home and search another app or start a new search, I could just click on the home button. This would be very helpful. Let me know if it can be considered. If I were to search for something like the Node Tool, for example, then I could see through the navigation, okay, that's how you get there. And then, next time, I'll remember. Also, if I want to go back to the home and search another app or start a new search, I could just click on the home button. This would be very helpful. Couldn’t you simply add the relevant URLs to your bookmarks? Yes, but that may not work for everyone, because then you'll add up with a dozen bookmarks. Being the organization freak that I am, I like to know the structure in which something is organized. For example, when I was in school learning about Adobe, I was taught a lot of the key commands (shortcuts) before first knowing the route path. And I struggled in remembering. If I found which menu the option existed in first, then it would give me an idea of which other options might also be listed there for when I'm lost. So I guess it's just a way to not find the detail but to become familiar with its category. Unfortunately, the Help File referred to here seems to be solely for the Desktop version - with nothing equivalent for the iPad version. A while ago, Forum member DM1 spent considerable time and effort to transpose the complete iPad version's in-app Help file into pdf format, and made it available to all. I have suggested to the forum moderators they might place it as a Sticky at the top the Resources and/or Support forum, since so many people have asked for such a useful file. Sadly, they have not, and so the post has become long-buried amongst past threads. It is not, of course, an official Serif document, but that is made absolutely clear in the post, and I can assure all it is an almost totally literal transposition - so I cannot see why Affinity have not made it a sticky. Perhaps they missed that (lengthy) thread - (in which case please excuse my irritation). I'd think the frequent, frustrated, requests for such a resource - not to mention the both accurate and generous efforts of DM1 - plainly make it just as worth highlighting here and in iPad Questions as this post.